Today is the day that the Rallymasters will be releasing the 24-hour riders’ bonus list. After weeks of wondering and waiting, I will finally get to look at the list and can start to plan my rally route. A lot of of nail biting and wondering comes down to tonight. At the beginning of a rally every rider will get a list of Bonus Locations. This list will include point values, bonus requirements, directions/address, what the rider is actually looking for (a statue, plaque, business, etc) and what time it is available. Rallymasters may include a brief story of significance of the Bonus Location. Your job is to construct a route that gets from the start location to the endpoint, within the allotted time while attaining as many points as possible. A rider must also allow time for sleep, fuel, meals, traffic, twisty roads, etc. 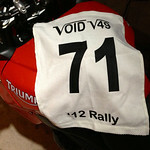 The logo of this years rally shows: √49 for Void Rally 7. I wonder how that will relate to the bonus list theme? Square root/route? Math-related bonii? I guess I’ll find out soon enough! Since I’m not riding to win, i don’t think that is possible, I am picking bonuses off of the list that I want to see while still trying to plan an efficient route that won’t have me DNF-ing. You’d love some of the bonuses! I am hoping you put up some of those bonus items so we don’t have to wait to have our curiosity sated. I am wondering how creative they were. I’m not clear about whether or not I can share anything that is on the list, so I’m gonna err on the side of caution.